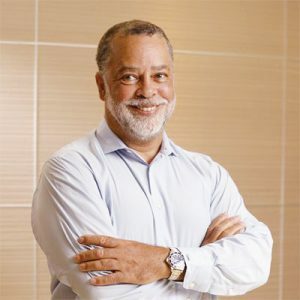 Prof. Thomas Bain has over 25 years of experience in Banking and Financial Markets, he was employed by the Central Bank of the Bahamas (4 years), JPMorgan (18 years), and Barclays Wealth (3 years). He has worked for a number of years in Nassau, New York, London, Tokyo and Hong Kong. His experience at JPMorgan included Fixed Income Sales, Emerging MarketsStrategies, and EMEA Markets Client Strategies. He also spent time as Global Head of Graduate Recruiting & Training. He was an MD at JPMorgan for 12 years. At Barclays Wealth he was a Director and Head of Transformation, and also worked for a year as a private banker. Prof. Bain moved to Hong Kong in 2009, where he created Bain Leadership Advisors Ltd. to provide training, executive coaching and leadership consulting to many of the world’s top financial institutions in the APAC region. He has worked on leadership programmes and executive coaching for Senior Executives at UBS, Barclays, JP Morgan, Société Générale, BlackRock, Credit Suisse, Bank of America/Merrill Lynch, BNP Paribas, HSBC and Morgan Stanley. Prof. Bain is an Adjunct Professor of Finance at The Chinese University of Hong Kong (CUHK) Business School, where he has been teaching in the MBA and MSc in Finance programmes. He is also an Associate Director in the MBA programme. He has received the CUHK Business School Faculty Award in 2011, 2012, 2013 and 2014 for his teaching. Prof. Bain has a BSc (Hons.) from the University of London, and an MBA from Columbia University. He is also a Professional Certified Coach (PCC) by the International Coach Federation (ICF).